Fit for a family of four, Scott Posno constructed this very modern domestic dwelling in 2014. 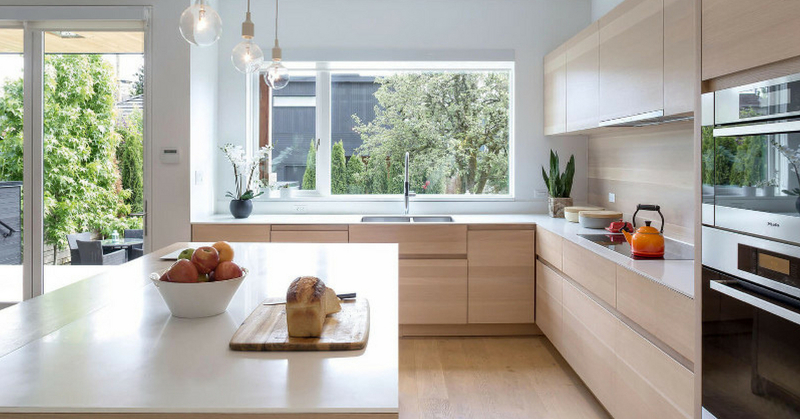 Located in the Mount Pleasant neighborhood of Vancouver, BC, Posno deliberately integrated its contemporary appeal with complementary details decidedly specific to the neighborhood’s locality. For example, the tinged cedar exterior resembles the wooden siding regularly used in the area. The entrance and doorway is brought in before the upper level, employing an essence of abstract for the residence and anyone stopping to admire this. It’s bold and black outside appearance obviously contrasts the light, creamy colors inside. The lights and brights that color the open floor plan widen the 3,000-square-feet that make up this home. A skylight open to all three levels of the house invites natural light as a regular guest, enhancing one of the most notable characteristics of the home, which is glass wall framing the staircase. The living room extends out into a greatly sized back deck, for families to enjoy the changing seasons together.